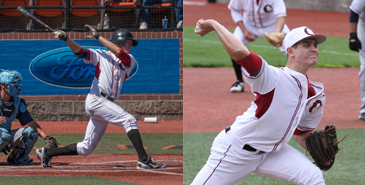 Two Corvallis Knights Make Baseball America Top Ten WCL Prospects List. Baseball America released its top ten WCL prospects list this past Friday, September 12th for the 2014 season. Two Corvallis Knights made the listing including first-team all-WCL utility man Dalton Kelly of UC Santa Barbara and starting pitcher Justin Calomeni of Cal Poly. Kelly led Corvallis in batting with a .336 WCL average and in triples with 4; and the junior-to-be blasted 7 league homers and collected 34 RBIs while playing stellar defense at first base. Calomeni started 7 games and went 1-3 with a 4.33 WCL ERA. Justin, a sophomore-to-be, struck out 37 and walked only 12 over 45.2 WCL innings and 10 appearances. For a complete listing of the West Coast League's top ten 2014 prospects as listed by Baseball America, please click here.